Going for an adventure is fun. However, a lot of planning is required to ensure everything runs smoothly. When it comes to backpacking, you want to save as much space as possible and include everything you need. 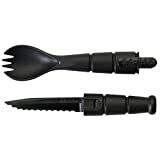 To make this possible, an adventurer should go for tools designed to serve multiple purposes such as a spork; a multi-functional utensil that serves as a spoon, fork, can opener, and knife. Length. Go for a spork that measures six to seven inches. This size is long enough to feed comfortably and small enough for backpacking. Colour. This depends on personal preferences. Some people prefer metallic to plastic sporks. Color enthusiasts prefer plastic sporks with vivid colors. Volume. Consider the volume indicated on the specifications to see if it will fit in your backpack. Multi-purpose. Depending on the nature and activities of your adventure, you may need more than a spoon, fork, and knife. Go for a spork that can be used as a utensil, weapon, screwdriver, or can opener. Single-sided or double-sided. Single-sided sporks are more straightforward and require less coordination when feeding. However, some people may have difficulties when eating soup with single-sided sporks. Folding. Sporks that can be folded are suitable for backpacking. 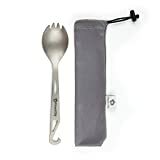 A folding spork is folded when being packed and unfolded to a bigger size when being used. Material. Most sporks are either made from plastic or titanium. Both types have their pros and cons. Titanium can be more durable but sometimes leave a metallic taste in the mouth. Plastic, on the other hand, is less durable compared to titanium but has a myriad of colors to choose from. Stability and durability. If you want a spork that you won’t have to replace anytime soon, go for a titanium spork. However, some plastic sporks are as durable as titanium sporks. A spork is an essential item on your camping list. So, don’t forget about it when shopping for your adventure’s gear. The idea of dining with your hands can be devastating. Here is a list of top eleven best sporks which have been tested and proven to be durable and versatile. The dual-ended spork has a fork on one end and a spoon on the other end. One side of the fork has a serrated knife. It is a lightweight spork which makes it ideal for backpacking. The handle has a rough texture at the middle to facilitate a better grip. The spork is made with 100% titanium which is heat resistant. Also, the metal surfaces are polished; thus, the spork does not have a metallic taste like other titanium sporks. This spork is ideal for all camping and outdoor adventures including fishing. It is dishwasher safe and safe for human skin. One pack comes with six sporks. The sporks are made from stainless steel which makes them corrosion-resistant and durable. One piece has a weight of 1.9 ounces and a length of 8.2 inches. They are dishwasher safe and ideal for daily household uses like eating ice cream, dessert, or salad. The sporks can be used by children, senior citizens, adults, as well as the disabled. Each pack contains four sporks. One piece has a weight of 1.3 oz (9 g) and a length of 6.75 inches. The sporks are manufactured in Sweden with Triton plastic which is safe for humans. It does not melt in hot food or soup. It is ideal for eating in short outdoor trips. The three-in-one spork has a spoon, fork, and a serrated knife on one side of the fork. It is not made from toxic chemicals like BPA. Though it is lightweight, it is highly durable and heat-resistant as well. The sporks come in different colors which makes them ideal for people camping with kids or color enthusiasts. The spork is made with titanium alloy. Titanium is lightweight but very sturdy. In addition, it is not toxic to human bodies. Each piece has a weight of 18 g and a length of 165 mm. They are packed in a cloth bag. The spork only features a spoon and a fork. The spork has a fork, spoon, and a bottle opener. It comes with a washable cloth for storage and backpacking. The cloth also prevents contamination of the spork. With the cloth, you can carry the spork to the office or keep it in your car. The sporks come in a set of two or one pieces. They are reusable. One piece has a weight of 0.7 oz and a length of 7.5 inches. The sporks are manufactured with 100% titanium which makes them lightweight, sturdy, and durable. The material is corrosion-resistant. It is also resistant to alkali and acid. Hence, they will last for years. FinessCity sporks are safe for humans and the environment as well. They are not only ideal for camping and outdoor adventure but also everyday use at home. One pack contains twelve pieces. They are suitable for a family, classmates or colleagues adventure. The sporks are manufactured with Tritan plastic which is BPA free. The plastic is 100% safe for humans, and it is environmentally friendly. It is also lightweight which makes the spork suitable for backpacking. The spork has a spoon, a fork, and a serrated edge on the fork which serves as a knife. The pack also comes with a bottle opener and a bag for storage and backpacking. The sporks have a classic design which makes them easy to handle. Children can comfortably use them. The multi-purpose tool can function as a fork, a spoon, a knife, and a spatula. The spoon and fork functions as regular cutlery. The spatula is used to scope food. 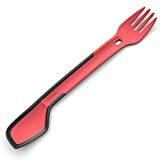 The spork has a rubber edge which helps the adventurer scrap all food and soup from the plate. It also facilitates cleaning as rubber is easier to clean and it does not require so much water. Morsel spork has a long handle which is perfect for scraping food out of a deep can without getting your hands dirty. The sporks are designed with a BPA free material which is very strong material. The sporks are durable. It is very versatile, and it cannot break no matter how you handle it in your backpack. Morsel sporks are dishwasher safe. They contain no toxic materials. Therefore, you can place them in your dishwasher without worrying about any health concerns. This is a good option for people who do not prefer plastic sporks. TOAKS titanium spork is manufactured with a heavy-duty material which makes it durable. 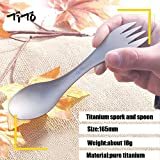 The weight of the spork is 0.4 oz which is suitable for backpacking. Another reason that attracts people to buying this spork is its classic design; the spoon and the fork are on one side. The spork is decorated with a matte finish. 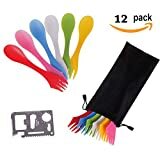 One pack comes with eight colorful sporks, a bottle opener, and a bag. The sporks are made from Tritan plastic which is a high-quality material. It is also BPA free. These sporks are durable, and they are not likely to bend or lose shape after some time. The spork has a spoon, a fork, and a serrated knife on one edge of the fork. They are designed for convenient use by people of all ages. The spoon is for eating soup and jellos. The fork is for eating fish, meat or sausages. The serrated knife is for peeling fruits or for cutting big chunks of food. Tapirus sporks are lightweight which makes them portable, and ideal for backpacking. The material of the sporks makes them scratch proof. After using the dishwasher, you can clean them in the dishwasher. The bottle opener is a bonus for opening a cold beer after meals or after a hike. 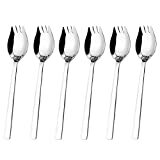 It is made from stainless steel which makes the spork corrosion-resistant, durable, and strong. One pack contains five sporks, a bottle opener, and a carrier bag. Steel is also resistant to bending or breaking. Each spork has a spoon, a fork, and a serrated knife at the edge of the fork. The spoon is meant for eating soup and jellos, the fork is for eating meat, and other solid food and the knife is for cutting food or peeling fruits. Though it is made with steel, the sporks are lightweight. The carrying case makes them portable and suitable for backpacking. They are also dishwasher safe. Though it is light to carry, it is manufactured from durable polymer plastic. It can withstand cutting through hard materials. The spork can be separated into two parts, one is a plastic knife, and the other one is the real spork. Its sturdy material makes it dishwasher safe. Besides eating with it, it can also be used for self-defense should a situation arise. A spork is meant to provide dining comfort while you are outdoors. 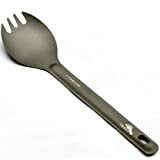 According to the best spoke reviews, a good spork is one that helps the adventurer scrap food from all sides of a can. It should also cook on a campfire. When it comes to buying sporks, there are many options available. People who love colors will go for plastic sporks which are available in various colors whereas people who value stability will go for titanium sporks. It is also essential to consider the weight of the spork. For backpacking purposes, go for a spork that is light and durable; meaning it won’t get broken by other things in your backpack. Lastly, sporks that serve multiple purposes are ideal for adventures. Buy a spork that can be used to do more than feeding.